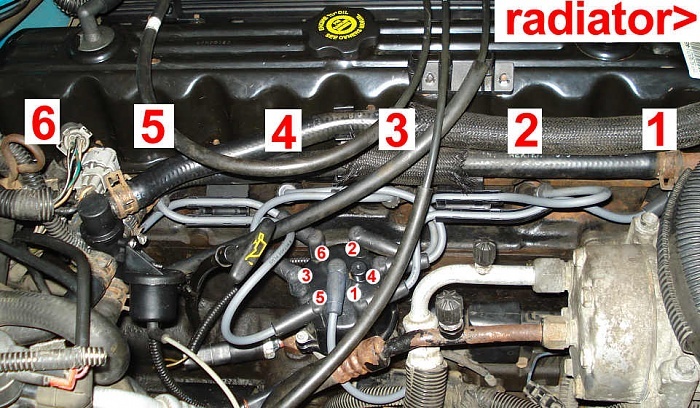 Remove the distributor cap and cut a “window” into the side of the distributor cap at the #1 spark plug wire post . The “window” should be large enough to allow easy visual inspection of the position of the distributor rotor at the #1 spark plug wire post. Reinstall the distributor cap. Use Tip 12 first to guarantee you’re on #1 TDC. Install a ¾” wrench or socket onto the vibration damper retaining bolt. Rotate the engine in a clockwise direction until the #1 cylinder is at top dead center. Align the timing mark on the vibration damper with the “0” degree mark on the front cover timing scale. The tip of the distributor rotor should be near the #1 spark plug wire post. Disconnect the distributor electrical connection. Remove the distributor holddown clamp, holddown bolt and distributor. Remove the distributor cap and rotor. Place the distributor housing upside down in a soft jaw vise. Scribe a line 1/2 inch from the end of the distributor locating tab. Cut the distributor locating tab at the scribed line with a saw. Remove any burrs and metal filings from the distributor. Reinstall rotor. If necessary, using a flat blade screwdriver, turn the oil pump gear drive shaft until the slot is slightly past the 11 o’clock position. The oil pump gear drive shaft is accessible through the distributor mounting bore in the engine block. A little tip here. Rather than use a dizzy gasket, use an o ring instead. NAPA #727-2024. Visually align the modified locating tab area of the distributor housing with the holddown clamp bolt hole. Turn the rotor to the 4 o’clock position. Lower the distributor into the engine block until it seats. The rotor should now be very close to the 5 o’clock position. Reinstall the distributor cap with the cutout “window”. 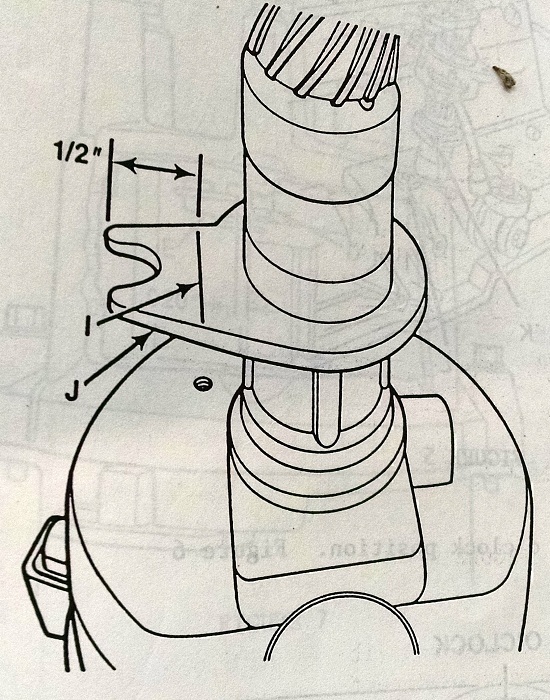 Rotate the distributor housing until the trailing edge of the distributor rotor tip is just departing from the #1 spark plug wire post terminal . 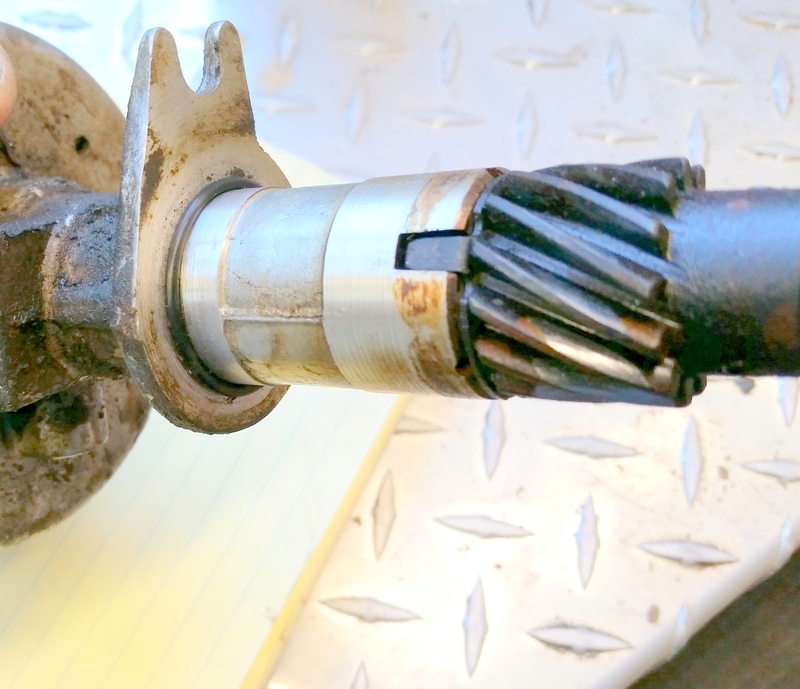 Reinstall the distributor holddown clamp and bolt.. Reinspect the position of the rotor to the #1 spark plug wire post to insure that it has not moved. 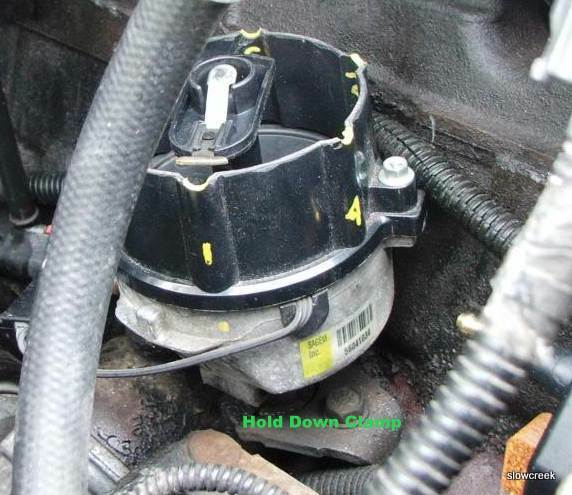 Install the new distributor cap, reconnect the distributor electrical connections. Thank you for all the great information. I am curious about the rotor position. You indicate is at TDC it should be at the trailing edge of the rotor should be at the #1 post. However, the Haynes manual states that it should be the leading edge. Why the discrepancy?? As usual Haynes is wrong about that, just as they are about spark plug wire placement on the distributor cap. The info I provided is directly from a Jeep Technical Service Bulletin and is proven to work. I changed my 89 xj 4.0 to this firing order and now it wont even crank. Why would this be? is my firing order different? When you reference the 4 o’clock position, where is 12 o’clock? This is facing the distributor from the passenger side fender with the #1 cylinder on your right? It’s looking at the engine from the passenger fender. That photo is in with the text on Distributor Indexing. After reindexing, where should the timing marks be when checked with a timing light? Why did Jeep put out a technical Service bulletin on distributor indexing? 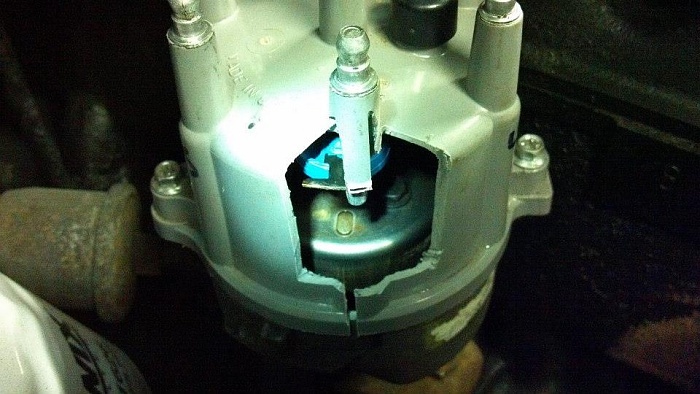 Was there a recall or another reason as to why the distributor needed re-indexing? They did it because there were some driveability issues with light throttle bucking. This explains why. It’s at the bottom of the distributor indexing tip. I’ve been working through all the steps and have come to this, when indexing the distributor once I have set top dead center the rotor button has about 10 degrees of play in rotation. Brand new distributor, should I take up the slack in clockwise rotation to set it or is this unusual? Is the rotor loose on the shaft or is the shaft turning? I discovered the real roll pin securing the gear on the distributor was split into multiple pieces. So I replace the distributor cleaned out the oil pan new oil pan gasket yesterday. Still … Starts to miss back fire and lose power after worming up while driving. Wold the tube headers be heating the intake or injectors up any more than normal? Still scratching my head. Going to go back and check all the new sensors for any bad out of the box ones. You indexed the distributor again, right? I wonder if you’re having a fuel delivery issue. Ever checked fuel pressure at the rail? Don’t worry about the headers causing too much heat. I checked and discovered the intake manifold bolts were not really tight. One of the bolts on the bottom is missing the factory washer and has a three-quarter inch lock washer underneath a flat washer on it. I keep finding stuff like this that the machine shop I had rebuild the engine did. One TPS bolt was broken off. MAP vac line was plugged off and laying on the intake. Three of the spark plugs were missing the seal washers on them. Missing bolts on the engine being replaced by longer bolts with a stack of washers to make up the difference. Etc. So with that in mind, same mechanic told me the fuel pressure was 50 psi and that the old one was blowing air bubbles through it when he disconnected it from the rail and turn it on. in spite of the headache I’m getting a very good education on the my Jeep. Thank you by the way for me and so many others. Yes I indexed the distributor when I replaced it. I’m sorry to hear this. If you need any other help, don’t hesitate to reach out. Thank you for all of your help. Yes I’m going to go back through everything and check behind him and myself. Tightening the intake exhaust manifold bolts didn’t change anything so I will look into the fuel delivery system. Kind of makes me wonder how he said there was air bubbles coming out with the fuel. He installed a new fuel pump but I think I might go and recheck that. Also the fuel pressure. i have 89 cheroke with a 98 grand cherokee motor. it had a cracked flex plate. put in nw one and now will only idle, will not excelerate, checked every thing could think of on the list, new fuel pump all vacum connects inj, tps only thing diff is flex plate. took it back out window off by 1/2 in. have ordered in several none match up will newer style with more solid ring work? what am i missing this is 3rd time taking apart, almost mor fun than i need. at 67 yrs old. thanks would sure apreciate ideas. love the site have learned a lot just not enough. Harold, some of the aftermarket Renix flexplates are faulty. I would look for a good used one. Is there anyway I could have you call me cruiser54? I just saw this. What’s your question? from my understanding of this TSB, we are essentially cutting the locating tab off in order to fine tune the alignment of the cap and rotor correct?